Baddour.net: Where should one live to minimize the probability of experiencing an earthquake? Where should one live to minimize the probability of experiencing an earthquake? Though it’s clearly not the only factor to consider when choosing a place to live, most of us have pondered this question at some point, especially on days like today (Re: Haiti). For some individuals, who can work from anywhere, have nothing tying them down to any particular location, or who are particularly risk averse, the question of minimizing earthquake event hazard could rank higher in priority. To satisfy my own curiosity, and perhaps be a service to others, I ventured to try to answer this question. We could start by studying maps of the edges of the global tectonic plates and noting the locations of prominent volcanoes in the world, since earthquakes tend to occur in those regions. However, that doesn’t really tell us anything about the likelihood of events occurring since many of those areas are fairly stable, geologically speaking. 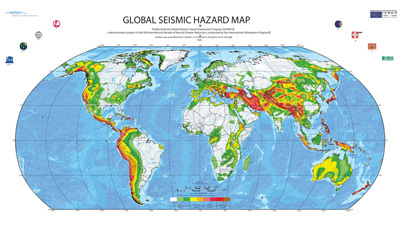 Luckily, in the 1990’s the United Nations sponsored a project with the goal of improving global standards in seismic hazard assessment: the Global Seismic Hazard Assessment Program (GSHAP). One of the outcomes of this project was a compilation of regional data to produce an international dataset of points where geologists have calculated the risk of “hard” shakes (high peak-ground-acceleration) as being above 10% in the next 50 years (well, that was as of a decade ago now). 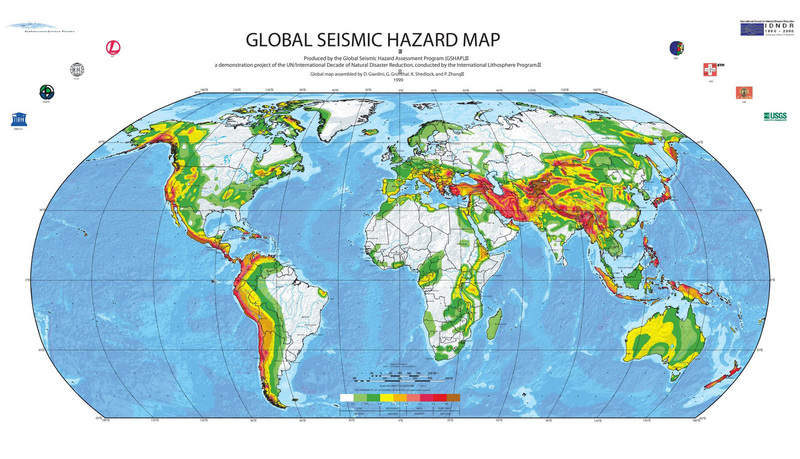 Here’s the GSHAP project’s global hazard map (below); areas in white or green may not be immune to earthquakes, but have the lowest probability of strong earthquakes.